Mine is the same, new hub, washers, clips, fork, etc. I ordered a new shift fork retainer spring and new Toyota bearings while I have it apart. I pulled the hub apart and everything was installed correctly. Amazing if that loose bolt made that god awful sound. As I'm installing the new TOB on the hub I'm noticing that there is some slow between the inner diameter of the bearing and outer diameter of the hub. Is this normal or is my hub undersized? It's brand new. I am pretty sure a little slop is okay, mine wasn't the tightest either. I'd just be really surprised if an OEM bearing was bad out of the box. 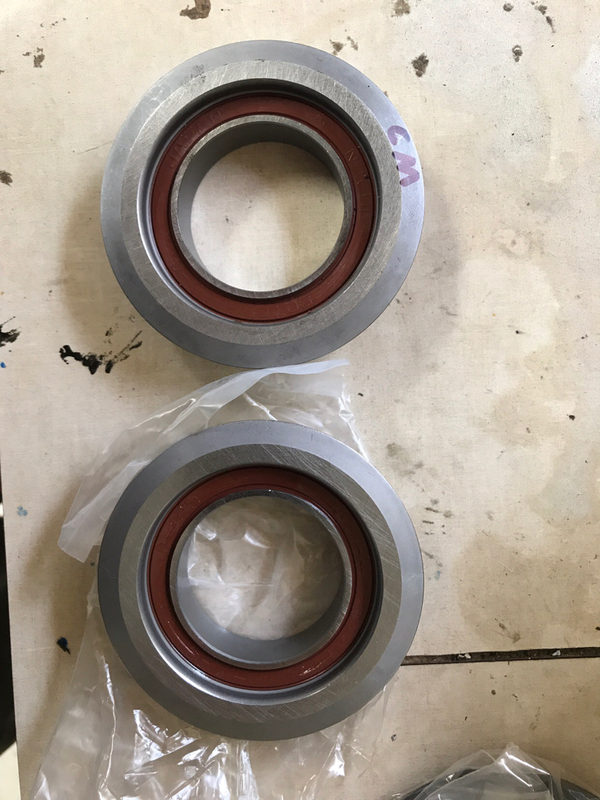 The new bearing that came directly from Toyota is soaked in packaging oil, where the CM OEM bearing came unpackaged and dry. But they look identical. New bearings and I'm getting the same thing - the hub appears to be out of round and/or not concentric. Will this matter? The outside of the bearing will in theory spin concentrically with the pressure plate fingers, but the ID of the bearing is going to follow the non concentric hub causing some weird gyrations and probably a load on the bearing. Maybe that's my noise? Driftmotion is sending another hub. Last edited by Elibutton; 07-25-2017 at 07:18 PM. I am dropping my r154 with about 300 miles on it since the new clutch to change out my timken input/output seals to OEM seals. 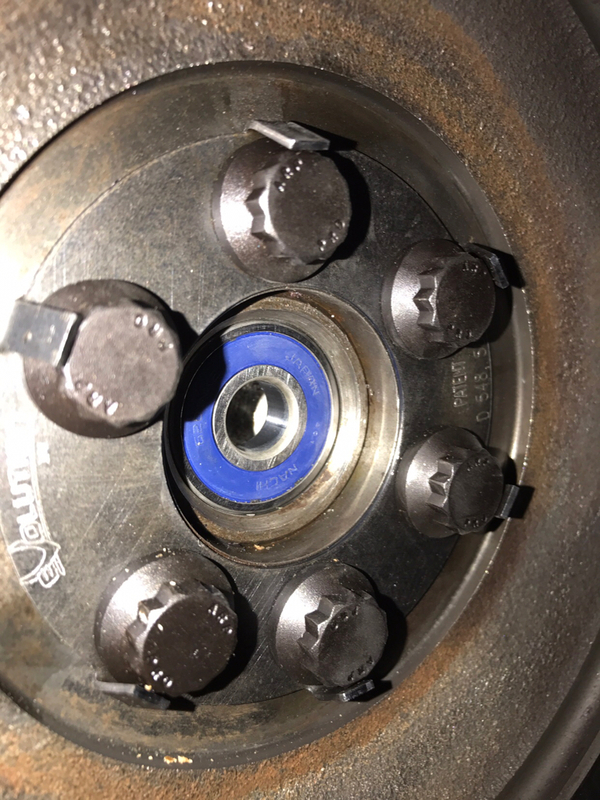 Here is a attached picture of where your pilot bearing should be and I also uploaded a quick video of the play in my new clutch hub assembly on YT. Hope this helps. Last edited by plaaya69; 07-27-2017 at 10:59 AM. First of all, thank you so much for taking the time to post this stuff. I really appreciate it. Your pilot definitely appears to be set in further than mine. I'm going to pull mine and put in a fresh one. I would have thought if the pilot was the issue, the sound would always be occurring? Never-the-less, the new one will be set further in. Is the YouTube video public? It's asking me to log in? You are welcome. I changed the video so it should play now. This is my first yt video so I adjusted the settings. Can you see a difference between yours and mine? Mine is not concentric from one side of the hub to the other, so if you tip the pressure plate on it's side the hub outside diameter raises and lowers as you rotate it. So it appears to be defective. Are you seeing the same? Yours definitively has a bit more out of round shape to it. I would even recommend checking with a dial caliper measurements in a top to bottom and left to right on both the hub and bearing and see if there is any difference in either. Okay I just pulled the pilot bearing out. It does appear that it might be damaged. It doesn't spin as freely as the new bearing. Once I removed the plastic covers on the bearing it began to spin freely. Wonder if those got damaged? I also noticed that neither the old or new pilot bearing fits easily over the input shaft. It appears that there is a high spot on the input shaft keeping the bearing from easily sliding over it. Anyone seen this before? This is a non functional area of the shaft, correct? Can I just remove some steel here? Last edited by Elibutton; 07-27-2017 at 04:01 PM. Plaaya69- what kind of sound do you get (or anyone for that matter) when you turn the input shaft by hand? I am halfway done putting my trans back together tonight but when I spin the input shaft it was just like a gears on gears sound (like when your in reverse but a lot more quiet) but also it was drained overnight so no fluid in it at all. When you install the new pilot bearing try to get in it with as few taps as possible. Put the new one in and then use your old no good bearing and hit that one so you don't damage your new one. I do this for new seals as well. Okay I have new TOB, pilot bearing, and a new hub installed. Hoping to install the trans tonight and getting running late tonight or tomorrow. Fingers crossed. That looks like it seated properly. Where did you get that blue bearing? From Toyota. I expected orange, but it's a Nachi directly from Toyota. Wait, I think blue is the high HP race version. Lol. I verified that everything was installed correctly, replaced the hub, TOB, pilot bearing, tightened the fork retainer, replaced the shift fork retainer spring, and reinstalled the transmission. Unfortunately i still have the same noise when the transmission is engaged and in neutral. I guess I'll call Driftmotion and discuss sending the transmission back for inspection. Not sure what else to do from here? Okay, transmission is coming out and heading back to California. Looks like I'll be down again for at least a few weeks. Very frustrating. Sorry to hear that. I would imagine they test them before they send the transmissions out but I have heard of a few others with some wired problems after the upgraded shift forks were installed. Did you have any video of your sound or check it with the inspection plates off? I wonder if your sound was like this one. When you press the clutch in, the main shaft stops turning. The input shaft will always be turning to an extent even when the clutch pedal is in. When the pedal is out, trans in neutral, the main shaft will be turning the countershaft, no wheels are moving as you are not in gear. The input shaft has a gear on it that turns the counter as long as it is spinning. The noise is most likely the trans. If you have a way to turn the trans out of the car with oil in it, try that. 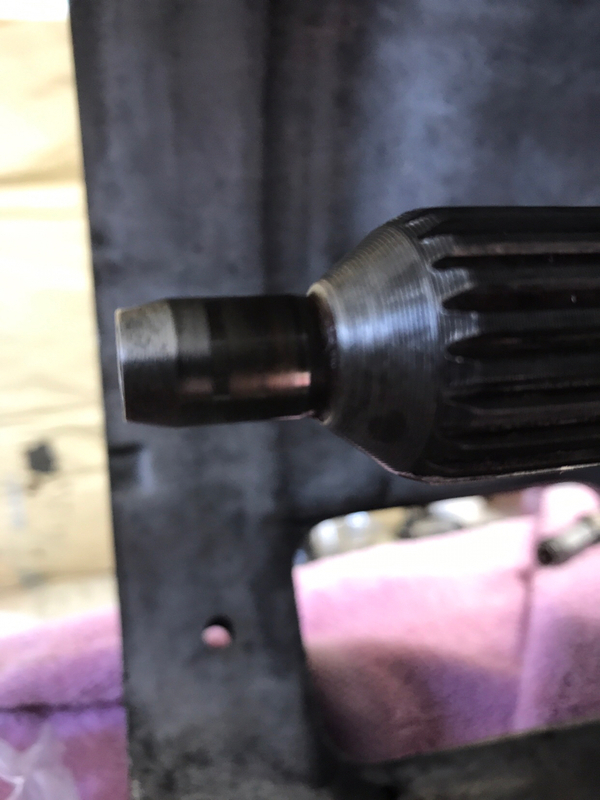 You can take a high speed drill and use a old disk and weld an old socket to it, put it in your drill, slide onto input shaft and spin the trans. It is a mediocre way of knowing but helps save time of shipping the trans and waiting for it back. Any exhaust shop can take weld an old impact socket for you. That noise seems loud so even if you are not spinning it at idle speed, it will still make a noise to hear at a lower RPM. You can even reuse the old oil, just run it thoroughly through some paint strainers since you will be flushing it out soon. Aaron is concerned it could be the input shaft or counter shaft and that those parts are now obsolete. Wouldn't this be something they'd have caught when it was opened the first time? Plus, the trans shifts smooth. If it wasn't for the damn noise. What are your thoughts? You can always find those parts used and that is what I was thinking as it should have been tested before it was shipped out to you the first time along with clearances checked as well during the rebuild. Did you drive with this transmission in the car before it got rebuilt? No it was purchased from a forum member and I sent it out to DM before installing it. So I have no history on it. It shifts fine, holds power, but the noise is indicating something isn't right. I shattered the thrust washer in one of my other r154s and it I knew it was broken right away. That's why this is perplexing. No vibration, smooth, yet that f$&@ing sound.